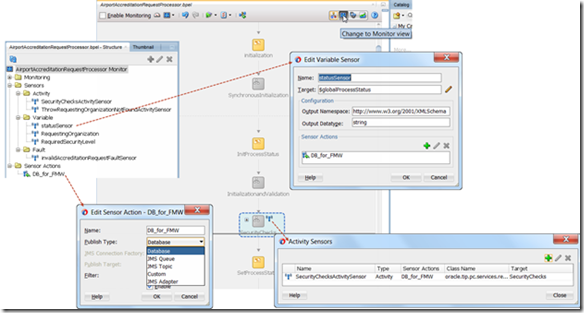 BPEL processes can report data about their execution using two different mechanisms. One is based on sensors that produce signals for specific activities that are executed, variables that are updated or faults that occur. These signals can be pushed to be reported in the EM FMW control along with other instance details. These values are stored in tables in the SOA Infra database schema where they can be accessed using SQL. 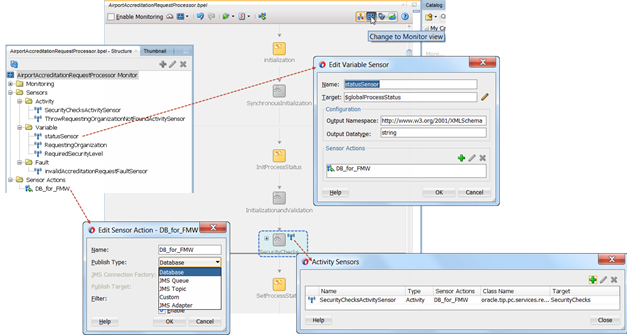 Alternatively or additionally, the sensor values can be published to a local JMS Queue or Topic, to a custom Java handler or to the JMS Adapter (for remote destinations). In this section we will be using various BPEL sensors to provide easy insight in the current state of a single process instance as well as some aggregated values for execution times. The process we will be looking at is the Airport Security Accreditation process that was implement in the AirportAccreditationProcessor BPEL component in chapter 18. This figure visualizes the BPEL process at the end of this section, with some sensors added to it, as implemented in the sources in AirportAccreditationService-step10. The sources for the final situation for this section are found in folder AirportAccreditationService-step10. The starting point is in AirportAccreditationService-step9 of the sources for chapter 19.